Bonifacia Rodríguez grew up as the daughter of a tailor in 19th century Salamanca, caring for her siblings and occasionally assisting her father with sewing. By 1865, her last surviving sibling married and Bonifacia remained with her widowed mother while making lace, rope, cords, and similar products to sustain their now shrunken household. While aspiring to join the Dominicans as a religious sister, Bonifacia instead found herself befriended by a Jesuit priest, Francisco Javier Butiña. Father Butiña had a recognition that God sanctifies people in the most humble of situations, and even outside of traditional religious life. Bonifacia had long years assisting in her father’s trade and now found herself working with her hands, and caring for an aging mother. She realized the connection of her labors with the quiet example of Joseph of Nazareth. 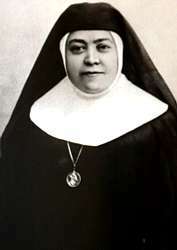 With Father Butiña, she established the Congregation of the Servants of Saint Joseph in January 1874. Bonifacia and her mentor develop a rather different model of religious life: women working with the support of one another, and providing a safe and harmonious environment for other women. But you might imagine people outside this circle would bring their criticisms to bear on it. The Spanish government ejects the Jesuits from the country in 1875–including her collaborator. A year later, a supportive bishop is reassigned to another see, and Bonifacia finds herself bereft of institutional support. Humiliations, rejection, disdain and calumnies fall upon her in order to make her leave Salamanca. The only response of Bonifacia is silence, humility and forgiveness. She leaves her home and continues her work in Zamora, as before: gathering poor women under one roof to labor simply and under the inspiration of Saint Joseph. Expansion in the new location continues, and permits the sisters to receive poor lay women as companions in work. Vatican recognition of the Servants of Saint Joseph comes in 1901, but a reunion of Bonifacia’s communities does not take place until a few years after her death. It is lamentable that jealousies and suspicions among otherwise well-intentioned believers sows such divisions deep within the Church. Some saintly, worthy figures rise above it all. Their opponents are consigned to the forgotten of the shadows.